What does Ens.Debug("LogETN") show and where are you see it in Management Portal? Does is show only errors, successful messages, etc? I want to get the total amount of time that a process is active or the timestamp that it was created/started. I tried the %SYS.ProcessQuery class, but I did not find any related information. Is there any way to get this information from a process? We want to monitor an Ensemble Production and send custom email alerts in function of some Rules. For example, if we normally receive 1 message per second, if suddenly we receive 5 or more messages per second, we want to send an email alert. And if tomorrow we don't want to check this again, we want to disable it through Ensemble Business Rules. I'm looking for the a simple-quick-easy solution to monitor a SQL table thought Ensemble. I looked around the community but didn't find an answerd case. is this the right approach or is there's a better solution? The message is received at all times. I need to monitor Caché Intersystems with some custom indicators. What is the best way? 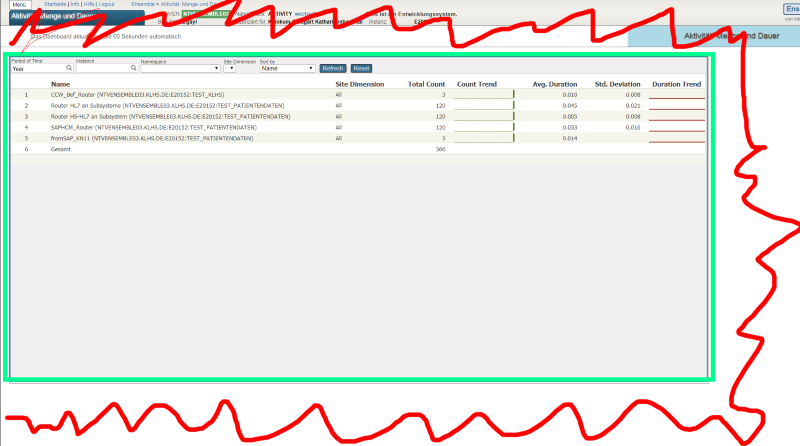 Use ODBC or SNMP Custom Mib? This post is dedicated to the task of monitoring a Caché instance using SNMP. Some users of Caché are probably doing it already in some way or another. Monitoring via SNMP has been supported by the standard Caché package for a long time now, but not all the necessary parameters are available “out of the box”. For example, it would be nice to monitor the number of CSP sessions, get detailed information about the use of the license, particular KPI’s of the system being used and such. After reading this article, you will know how to add your parameters to Caché monitoring using SNMP. How to read Health Monitor sensors and/or warnings and alerts programmatically? Back in August in preparation for Global Summit I published a brief explanation of Application Performance Management (APM). To follow up on that I have written and will be publishing over the coming weeks a series of articles on APM. I would like to implement the Activity Monitor in a Sharepoint page. How is it possible to integrate only the Zen element? Is it necessary to develop a CSP application in which this element exists? Has anyone done this before and can I get a tip? Prometheus is one of the monitoring systems adapted for collecting time series data. Is it possible to dynamically adjust the RetryInterval andFailureTimeout settings in a BPL? I've got a business process that calls a web service operation to get a session ID from an external system. There is a string property returned in the body of the response that indicate an exception occurred in the external system. I have code in the BPL that examines the property and sets the status property to an error status when that occurs. Depending on what the value is I want to adjust the RetryInterval and FailureTimeout values used in by the system when the ReplyCodeActions is set to E=RD. Example: If the string is "No sessions currently available" I want to retry every 15 seconds for 10 minutes before disabling the process and raising an alert. If instead the string is "System is down for nightly maintenance" I want to retry every 5 minutes for 4 hours before disabling the process and raising an alert.